Inflation. Deflation. Bubbles and busts. Our Global Macro Hedge Fund is all about capitalizing on big-picture trends and imbalances while hedging risk. Our global themes are enhanced by expert fundamental analysis and stock picking. The Tech Bust. The Global Financial Crisis. The Crescat Long/Short Hedge Fund strongly outperformed during two of the worst bear markets in history. Investors in the Long/Short Fund value the fund’s strong risk-adjusted returns, achieved with a focus on long and short equities. Time tested. Proven results. Crescat Large Cap is a separately managed account strategy for discerning investors who appreciate the value of high-quality companies with strong free cash flow and professional, active management. Crescat Capital manages private hedge funds and separate accounts through its wholly owned subsidiary, Crescat Portfolio Management LLC, an investment adviser registered with the U.S. Securities and Exchange Commission. Registration as an investment adviser does not imply a certain level of skill or training. Crescat Portfolio Management claims compliance with Global Investment Performance Standards (GIPS®). Prospective clients can obtain a compliant presentation and the firm’s list of composite descriptions by visiting our website at https://www.crescat.net/resources/due-diligence. We may disseminate information that is supplemental to the GIPS-compliant presentations included on our website. Prior to making any investment or hiring any investment manager you should strive to understand the strategy or private fund’s investment objectives, risks, fees and expenses carefully before investing. Crescat’s private funds are being offered in reliance on an exemption from the registration requirements of the Securities Act of 1933 and are not required to comply with specific disclosure requirements that apply to registration under the Securities Act or under the securities laws of any state. The SEC has not passed upon the merits of or given its approval to any of Crescat’s private funds, the terms of any offering, or the accuracy or completeness of any offering materials. A registration statement has not been filed for any of Crescat’s private funds with the SEC. Interests in private funds are typically not listed on an exchange and are subject to legal restrictions on transfer and resale. Investors should not assume they will be able to sell their securities. Private funds are speculative investments, and are not suitable for all investors, nor do they constitute a complete investment program. Investing in securities involves risk. Investors should be able to bear the loss of their investments. See the private offering memorandum for each Crescat fund for complete information and risk factors. Only accredited investors and qualified clients will be admitted as limited partners to a Crescat fund. For natural persons, investors must meet SEC requirements including minimum annual income or net worth thresholds. Performance data represents past performance, and past performance does not guarantee future results. Performance data is subject to revision following each monthly reconciliation and/or annual audit. Current performance may be lower or higher than the performance data presented. Crescat is not required by law to follow any standard methodology when calculating and representing performance data. The performance of Crescat funds may not be directly comparable to the performance of other private or registered funds. Returns are presented net of management fees and performance fees. The currency used to express performance is U.S. dollars. Performance includes reinvestment of dividends and other earnings. 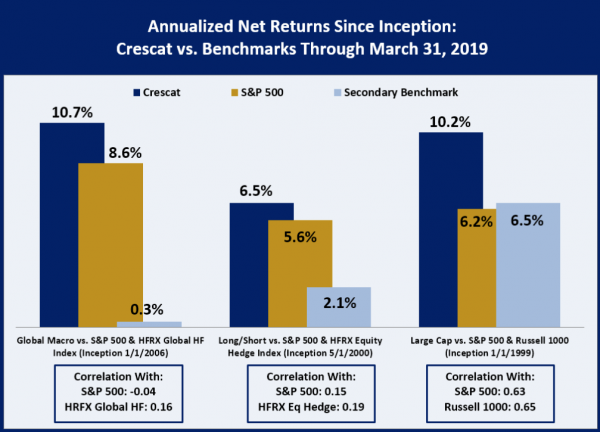 When we provide S&P 500 Index performance information side by side with Crescat’s performance, please note that the S&P 500 Index is one of the most widely followed stock market indices in the world. It is considered representative of the US stock market at large. It is a market-cap-weighted index of the 500 largest and most liquid companies listed on the NYSE and NASDAQ exchanges. While the companies in the S&P 500 are U.S. based, most of them have broad global operations. Therefore, the index is also representative of the broad global economy. It is a suitable benchmark for Crescat Large Cap, Crescat Long/Short, and Crescat Global Macro performance composites which have also traded extensively in large, highly-liquid global equities through U.S.-listed securities. For comparison of Crescat strategies to additional benchmarks, including hedge fund benchmarks with respect to Crescat’s hedge funds, please download the performance reports using the buttons above. Investors may obtain the most current performance data and private offering memorandum for a Crescat fund by contacting us at (303) 271-9997 or by sending a request via email to info@crescat.net.